Germans on time: Punctuality, or punktlich, really is important in Germany. Germans Really Are More Punctual. Just Ask Angela Merkel. 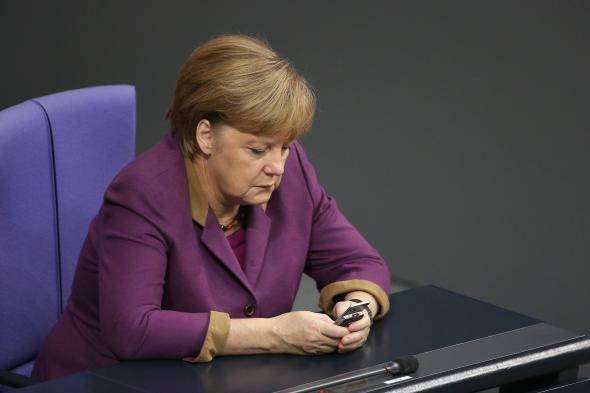 Angela Merkel looks at her cellphone (to check the time, presumably). You may not agree with Angela Merkel politically—although honestly it’s a bit hard to analyze her ideology in its proper context, given the unfamiliarity to Americans of Germany’s multi-party system; I mean, there are two different kinds of Socialists and a Pirate contingent. But you have got to love German Chancellor’s style. (And I don’t just mean the spectacular Bell-Biv-Devoe-esque tunic she’s been wearing to every opera since shortly after the Berlin Wall fell.) Last week, when pocket-sized despot and notorious tiger-misplacer Vladimir Putin was late to a meeting with Merkel in Milan, she straight-up bailed on him, because Angela Merkel, not unlike the immaculate Berlin-to-Frankfurt InterCity Express, operates on a tight schedule. One of the first adjectives any beginning German student learns is pünktlich, or punctual. Yes, being pünktlich is likely a requirement for that very German class, but the prominence of the word goes beyond that fact. Along with the adjectives vernünftig (reasonable) and günstig (both affordable and convenient), pünktlich describes a concept as intrinsically German as the umlaut that graces its first vowel. All you American urbanites out there, imagine, if you will, a place where the subways and buses—regardless of traffic or weather—usually show up to the minute according to the clearly printed timetable hanging prominently at every stop. The Germans don’t have to imagine this, because they take it for granted. Almost everything in their country—with the possible exception of its bazillion-party parliamentary government—runs with utmost efficiency, from coffee machines to the dispensation of insurance-paid spa cures. Sure, there are exceptions. Everyone has at least one chronically late friend, for instance. In the days before mobile phones, I spent a lot of time standing on U-Bahn platforms, smoking under the Rauchen Verboten sign as I waited for people. Another fun exception is university classes, which often begin according to the akademisches Viertel (an “academic quarter” of an hour later than the posted start time). Just like Putin seems to have empire-expansion running in his veins, so has Chancellor Merkel punctuality running in hers (according, I am sure, to a fixed schedule). So when you have someone waiting to meet your train in Germany, expect them to be exactly on time, even at 4 a.m. this coming Friday. And if you have Angela Merkel waiting for you anywhere, for any reason, you best be pünktlich, too.